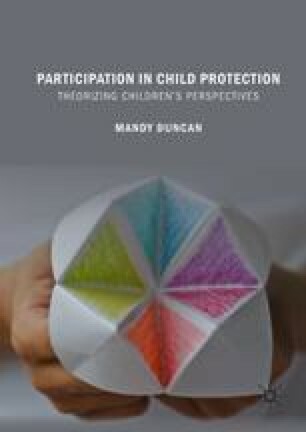 Within this chapter, I discuss children’s experiences of participation in state child protection interventions in the UK from the perspectives of children. Each individual child who comes into contact with the child protection system is unique in terms of the ways in which their health, development and life outcomes are impacted by their experiences, and each will have a personal narrative, but there are also some distinguishing features of the experience which are familiar to many children undergoing child protection interventions. These features emerged from the findings of a systematic review of literature undertaken in the early stages of the research project and which was conducted primarily to locate and synthesise all known evidence of children’s experiences of participation in state child protection interventions in the UK. The chapter identifies and discusses the five key features which emerged from children’s accounts and which are important as they reveal some collective understandings of children’s participation in the child protection system as perceived by the children within it. Ofsted. (2013). Social Care Report 2012–13. Available at: www.ofsted.gov.uk/resources/120351. Accessed February 10, 2015.